It’s 3am, 30 degrees, and the lights switch on in the barn. Twenty cows are herded into the milking parlor above the operating pit. As milk is pumped from the Holsteins, it travels through tubes into two stainless steel bulk tanks where it is filtered and cooled. Three hundred cows will be milked that morning and then again, 12 hours later, each producing about 55 pounds of milk per day. 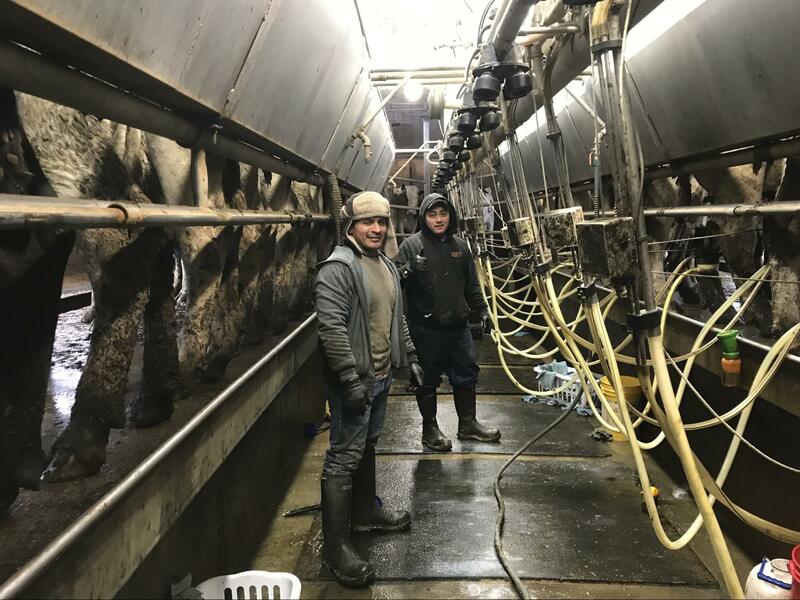 Two employees at the McKnight Farm milking during the morning shift. The bulk tanks sit in the milk house of the McKnight Farm in East Montpelier. They hold up to 4,000 gallons of milk and are emptied every other day when the milk truck comes. 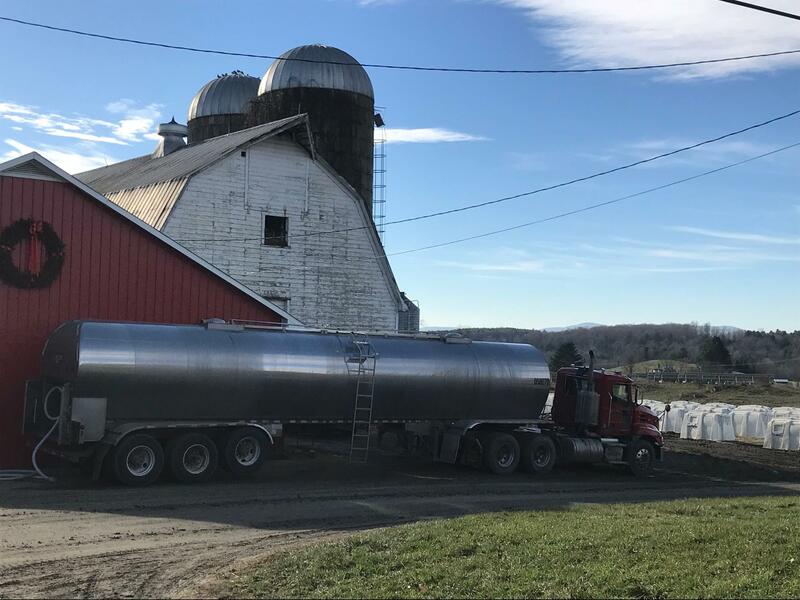 The milk truck holds up to 8,000 gallons of milk and carries the raw, organic milk from the McKnight Farm to a Horizon Organic factory site to be tested and processed. A milk truck from Horizon outside the milk house of the McKnight Farm one morning. The McKnight Farm has not always shipped organic milk. Seth Gardner, the owner, converted to organic in 2006 as the demand for organic milk began to increase. Due to organic regulations, Gardner now faced increased costs, annual inspections, and difficult farming. However, the price he was paid per hundredweight (cwt) for his milk went from $12 to $27. Over the next ten years, he would only see that price rise as demand for organic milk soared. But at this time, organic farming was not cheap. Gardner faced a grain bill of almost $50,000 per month, an unusually high price. He considered returning to conventional farming more than once. As the milk companies had hoped, many farmers were attracted to the high prices that followed the shortage in 2010 (and another in 2015) – especially in light of falling conventional prices. Farmers began converting to organic farming and producing more milk. In those years, Gardner installed a new milking parlor, added on to his freestall barn, and bought acres of land. But the trend would not continue. In July of 2017, Gardner was informed by Horizon Organic that his milk prices would drop four dollars per cwt — from $35.50 to $31.50 — leading to a drop in his revenue of over 200,000 dollars. In their letter to Gardner, Horizon claimed that the price drop was due to an oversupply in milk. They stated, “There simply isn’t enough consumer demand for organic milk.” Too many farmers had rushed to meet the demand, and wholesalers were now being shipped more milk than they could sell. Gardner is not the only one seeing his prosperity stunted. While the farms of the East are more heavily affected because they are smaller and more numerous than the large factory farms of the West, this is seen as an issue within the national market. 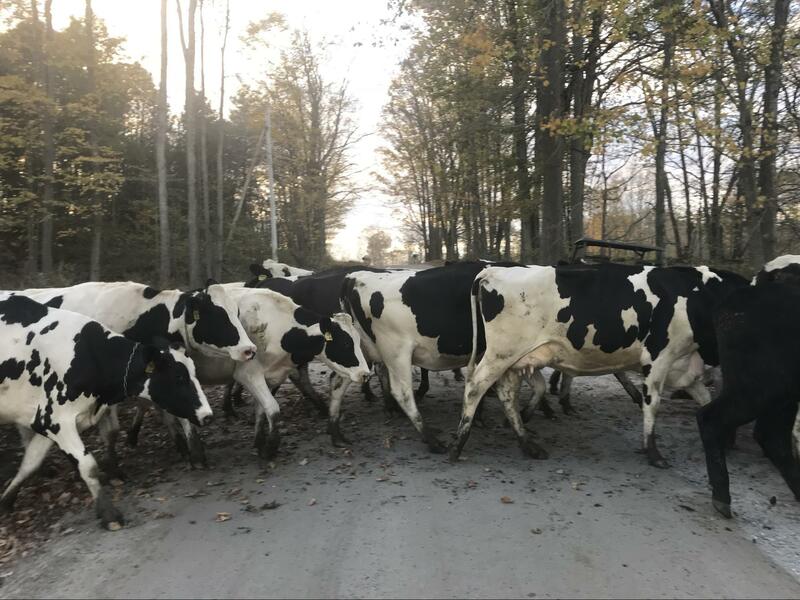 The McKnight Farm milking herd being crossed to fresh pasture, a practice Gardner conducts multiple times per day to ensure the cows are getting top quality feed. This disparity is partly due to the uncertainty companies face over how much organic milk they are being shipped. Economists would largely blame this uncertainty on elasticity: how much a market will respond to a change in price. Milk supply is inelastic in the short term because farmers cannot immediately increase or decrease how much milk they are producing. Over time, they may choose to increase their herd or grow a different type of feed, making their milk supply elastic to meet higher or lower prices. Short term inelasticity in the milk market is also due to the three years it takes for a farm to become organic. Gardner remembers waiting for the chemicals to be broken down in the fields, for the artificial hormones to leave the cows’ blood streams. Until these changes were complete, he could not ship his milk organically, leaving Horizon unable to anticipate how much more milk they would be purchasing. Not only were wholesalers unable to predict how much milk they were adding to the market, but they could not predict how much milk was needed. Due to multiple shortages in organic milk, companies were not able to accurately estimate consumer demand. It was not clear until recently that they had taken on too many farms that were producing more organic milk than was needed. Wholesalers are not the only influence on the organic milk market. The United States Department of Agriculture (USDA) also affects the milk supply through its inconsistent organic regulations. The USDA commissions state organizations to hire inspectors to enforce organic regulations. Every spring, the Northeast Organic Farming Association (NOFA) sends an inspector to the McKnight Farm to tour pastures and barns, read Gardner’s daily herd records, and scour the milk house for a sanitation hazard. Passing this inspection allows farmers to be certified organic. However, The Washington Post revealed that this is not the case for all farms across the country. Cows from the McKnight Farm out to one of several of the farm’s pastures in East Montpelier. Companies have reacted to the oversupply by setting quotas on milk production, paying farmers less for excess milk, and limiting the number of new organic farms. They have lowered prices for farmers to try and lower store prices of organic milk, hoping to increase demand to meet the surplus supply. Meanwhile, if you take a trip to the McKnight Farm, you will no longer be able to find Gardner sitting in the house making a phone call. You will find him on a skid-steer, at 6:30 in the morning, pushing feed towards his cows. Neuman, William. “Rising Production Costs Cause Organic Milk Shortage.” The New York Times, The New York Times, 29 Dec. 2011, www.nytimes.com/2011/12/30/business/rising-production-costs-cause-organic-milk-shortage.html. Mansfield, Erin. “Farmers See Organic Milk Prices Drop.” Farmers See Organic Milk Prices Drop, Valley News, 27 Aug. 2017, www.vnews.com/organic-milk-prices-drop-12117194. Whoriskey, Peter. “Why Your ‘Organic’ Milk May Not Be Organic.” The Washington Post, WP Company, 1 May 2017, www.washingtonpost.com/business/economy/why-your-organic-milk-may-not-be-organic/2017/05/01/708ce5bc-ed76-11e6-9662-6eedf1627882_story.html?utm_term=.caf4f2171f52. “Washington Post Investigative Report Documents Rampant Corruption at USDA Organic Program.” Cornucopia Institute, 2 May 2017, www.cornucopia.org/2017/05/washington-post-investigative-report-documents-rampant-corruption-usda-organic-program/. This is a fascinating article. What a challenging business to be in. It seems you need to be an expert in so many areas. I hope our farners can sustain their livelihood under these pressures.